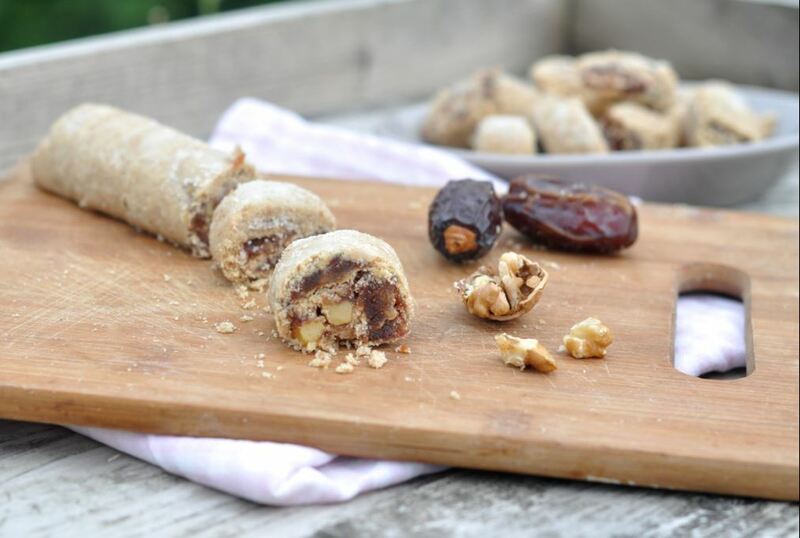 Date cookie stuffed with walnuts and sesame paste - Mehadrin Tnuport Export L.P. Mix the butter or coconut oil and sugar or agave syrup in a food processor. Add the remaining ingredients and turn the machine on. Do this as long until a cohesive dough. Knead as short as possible with your hands. Then roll the dough into two rectangular flaps of a thickness of 3 to 4mm. Use some flour if the dough sticks to the work shelf. Put the flat dough rolls covered with plastic wrap, for at least an hour in the refrigerator to firm. Meanwhile, make the filling: put the dates in the food processor. Add the date syrup, tahini and cinnamon and mix for a few seconds until no large pieces of dates remain. Another way is first to put the dates in a appropriate colander or to steam them in the microwave. This takes about 10 minutes. Then they are soft and easy to work with. Remove the dough from the refrigerator rags and place on a work table, sprinkled with a little flour. Lubricate the date mixture onto the dough laps. Sprinkle with nut pieces and roll them closed. Mark with a knife dashes to divide. Role in equal parts. Then place the dough rolls on a baking sheet with parchment paper or not. Place tray in the middle of the pre-heated oven for 30 to 35 minutes until they are browned. Sprinkle when they are still warm with powdered sugar if necessary. The baked or unbaked cookies can also be frozen. The unbaked cookies can be frozen up to four weeks. After thawing, you just bake them in the oven.